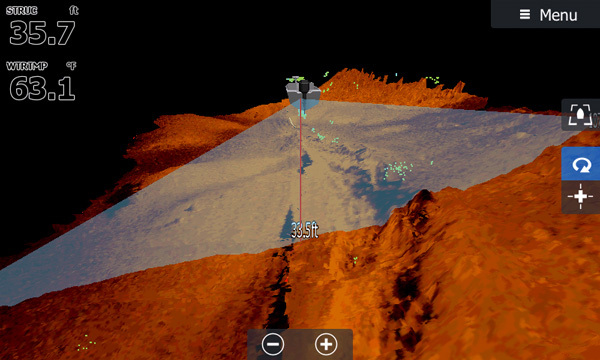 ForwardScan provides forward-looking, two-dimensional sonar views of the bottom ahead of your boat. In shallow, unfamiliar, or poorly-charted waters, ForwardScan is a powerful defence against running around, and an invaluable tool for locating secure sites to drop anchor. e.g. at 3m (10ft) depth, see up to 24m (80ft) ahead. e.g. 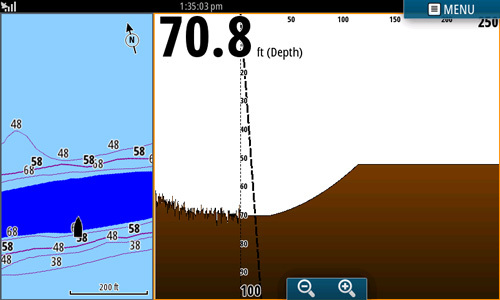 At 3m (10ft) depth, see 12-15m (40-50ft) ahead. 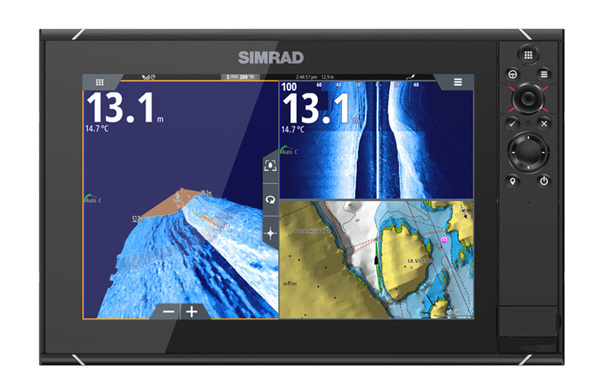 Heading Line View integrates ForwardScan depth data with the heading line displayed on the navigation page of your Simrad MFD. The line is colour-coded in segments to represent deep, medium, and shallow water, with customisable depth ranges to suit your boat’s draught. 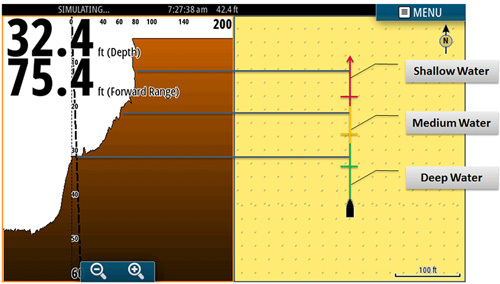 ForwardScan’s forward range scale is automatically synchronised with the length of the heading line: in split-screen ForwardScan/Navigation view, the full distance from your vessel to the end of the heading line is represented in 2D on the ForwardScan display. Quickly reconcile ForwardScan data with charted depth and your present course, for a comprehensive understanding of what’s ahead. 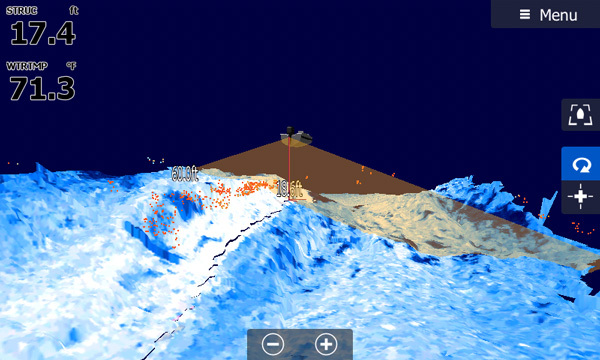 Bottom Colour Tracking offers a solid 2D rendering of the bottom ahead of your vessel for an uncluttered, immediately understandable view. 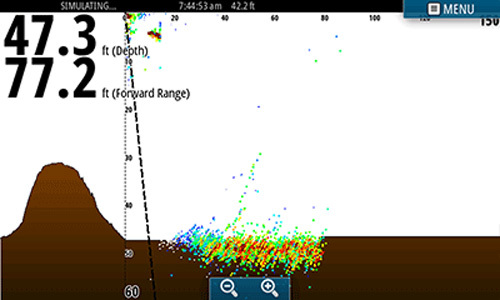 Make fast and well-informed navigational decisions, without needing to interpret the individual data points returned by the echosounder. 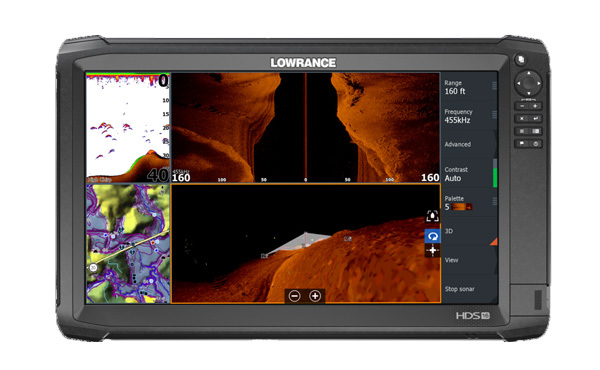 ForwardScan connects quickly and easily to any B&G Zeus3, Simrad NSS evo2 and evo3 multifunction display via the StructureScan port, with no additional hardware necessary. 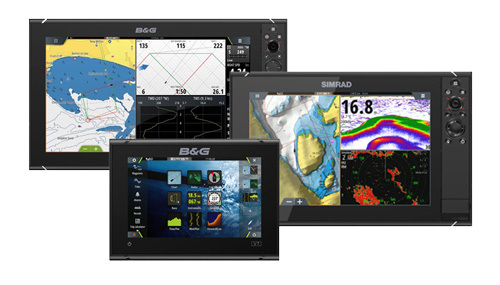 On B&G Zeus3 Glass Helm, NSO evo2 and evo3 modular systems, or NSS evo2 systems already using StructureScan, ForwardScan may be connected via an optional B&G/Simrad SonarHub sounder module. ForwardScan can be installed on almost any vessel, with 50.8mm (2”) stainless steel through-hull mount. The mount can accommodate 25.4mm (1”) thick hulls at 12° dead rise, or 19mm (3/4”) hulls at 20°. 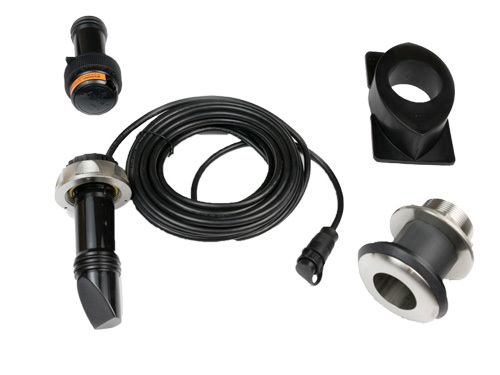 An optional pre-install kit includes sleeve and blanking plug only, allowing boat-builders to provide ForwardScan as an upgrade option. A ForwardScan transducer can then be added by the dealer or customer, even once the boat has been splashed. 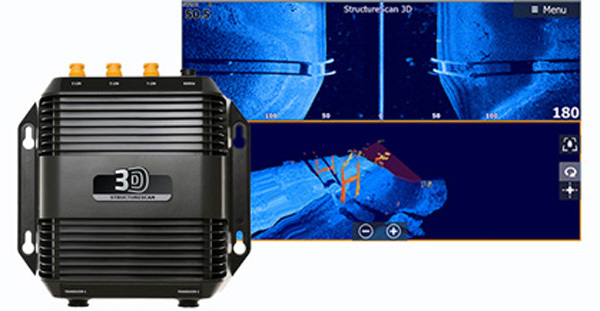 StructureScan 3D gives freshwater and saltwater anglers a unique, three-dimensional view of fish, structure and bottom contours — making it easier to understand where fish and structure are located in relation to your boat. 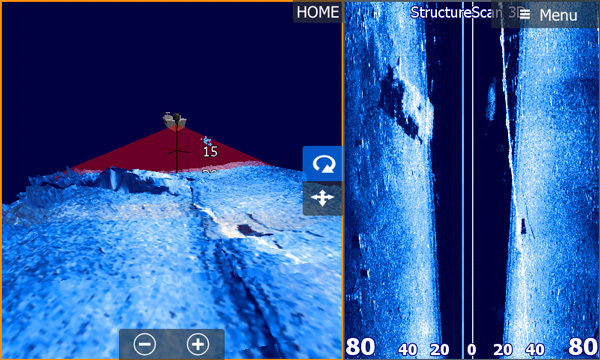 With StructureScan 3D, anglers spend less time searching for productive water and more time catching fish. 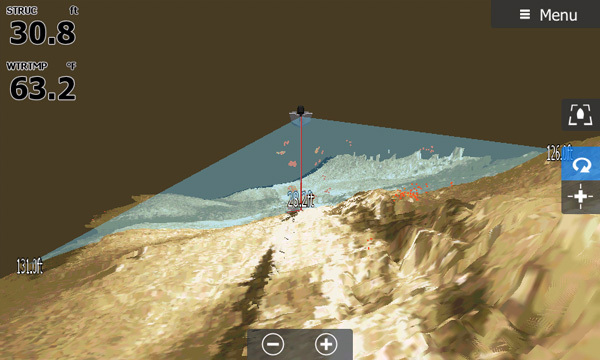 StructureScan 3D showing ScanTrack™ view of fish holding near rock abutment in both 3D and SideScan formats. Distinct fish targets at different depths against drop offs. SelectScan shades fish and fish-holding cover in a contrasting colour for easier target identification.